Also, if Trier doesn't have a HUGE finish this season, think his draft value is still 1st round? If not does he stay another year? If/when Trier comes back, who loses minutes? PJC is impressive but Cats have two big men that are impactful this year. Would have been a great dunk! Gotta love a half that has just 11 total fouls and 11 total turnovers. No touch fouls called so far. 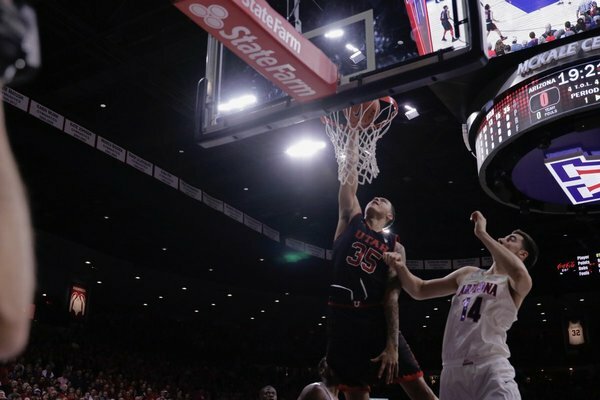 Who was supposed to be guarding that guy on Utah's last score? Grr. Pinder checking in for Lauri for the final seconds of the first half. Parker has seven assists, two rebounds and no turnovers. Not bad for a first-half stat line. Sean Miller takes a timeout here with 32.3 seconds left in the first half. Arizona leads 33-27. Parker AGAIN to Dusan. They're really feeling that connection right now. PJC with another DIME to Dusan. That's a money shot for Dusan! PJC finds Dusan down low for the layup. Lauri Markkanen with 9 points, 4 rebounds on perfect 3 of 3 from field. Wildcats also 5 of 5 at FT line. Arizona only has five assists total tonight. PJC has three of them. Markkanen leads Arizona in scoring with nine points. He hasn't missed a field goal or free throw so far tonight. 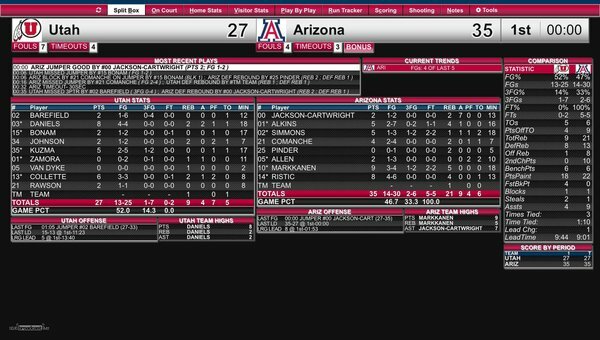 At the media timeout, Arizona leads 25-21 with 3:56 left to play in the first half. Markkanen, our best offensive player, has taken three shots... Miller doesn't seem to get that the ball belongs in the hands of your best offensive player. He keeps using Lauri like Tarczewski, as a big pylon to set screens, instead of putting him in position to score. We've got a 2-point game. UA leads 23-21. Utah connects on a nice alley-oop. Lauri knocks down both his free throws. He's got nine points. If Cats give up another layup Miller might blow up! PJC getting his shot back! I always wonder what it would feel like to be as good at basketball at Lauri Markkanen is. Rawle and Dusan checking back in. WOW! PJC just had a block on a big man! Different zone defense, same ugly game. Pathetic. Lauri knocks down the triple. McKale Center is loving this.